This week, we had the honor and privilege of hosting Engage!15, a luxury wedding business summit, right here at the Walt Disney World Resort. Rebecca Grinnals and Kathryn Arce are the masterminds behind this innovative, intensive conference that focuses on nurturing and igniting the entrepreneur in all of us. We were able to share with the over 350 attendees what we do best here at Disney- surprise and delight. 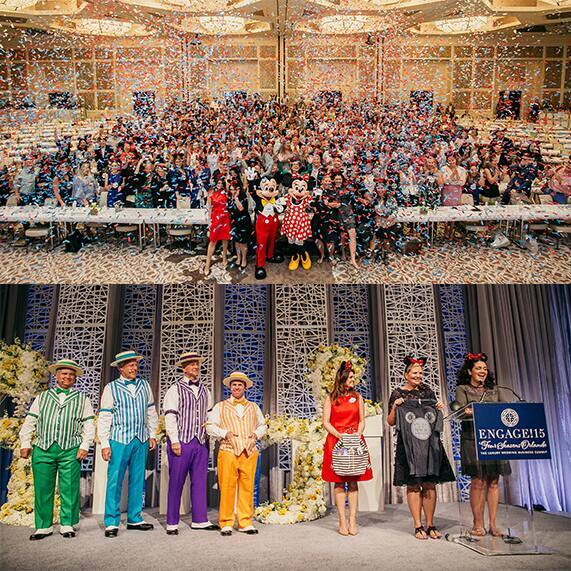 Sending the attendees to Mickey's Very Merry Christmas Party was definitely a conference highlight and we had the help of the entire Main Street Philharmonic Band, The Dapper Dans and Mickey Mouse himself to make this moment truly sparkle. And if that weren't enough, we shared that Disney's Fairy Tale Weddings & Honeymoons will be celebrating 25 years of fairy tales next year. Be sure to stay tuned in 2016 for more details as we celebrate 25 years of weddings, honeymoons and happily ever afters!